Rhett Butler calls himself an "obsessive-compulsive guitarist." Whatever you choose to label him, the musician, famous for his unorthodox technique of playing two guitars at once, sure knows how to turn heads. 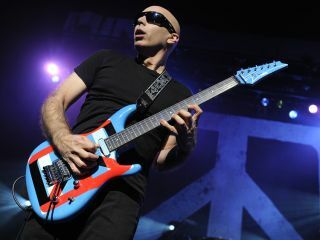 Like Joe Satriani's: the Chickenfoot and solo shredder recently posted the above video of Butler doing his double-guitar thing on the song Always With Me, Always With You (from Satch's 1987 album, Surfing With The Alien; the track was recently sampled on Nicki Minaj's Right Thru Me). Satriani, a fan of most things wild and wacky, pays Butler perhaps the highest of compliments on his Facebook page, deeming the video "a bit insane."